Okra is a many seeded, rough, green pod shaped vegetable. It is used to thicken soups and stews, and as a cooked vegetable. 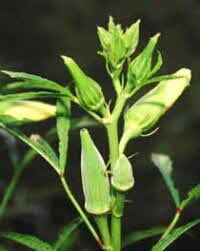 Okra is native to tropical areas of Africa, and was cultivated in Egypt in the 12th century. Okra is a species of the Hibiscus genus (Hibiscus esculentus) and a member of the mallow family (Malvaceae). The Mallow family of plants (Malvaceae) includes hollyhock, the cotton plant, okra, marsh mallow and the Rose of Sharon. The roots of the marsh mallow (Althaea officinalis) were the source for the original marshmallow candy, made by boiling the soft inner pulp from the roots with sugar until very thick. Lady's Fingers is another name for okra. This name only dates back to the early 20th century, and originally applied to a small variety of okra. The kidney vetch, with small thin flowers said to resemble a small hand originally held claim to the name 'lady's fingers' (17th century), but in the late 19th century the name was applied to varieties of potatoes, apples, bananas and grapes. Most have gone by the wayside, but the 'lady's fingers' name is still associated with okra, and of course, ladyfingers as applied to a small finger shaped sponge cake.